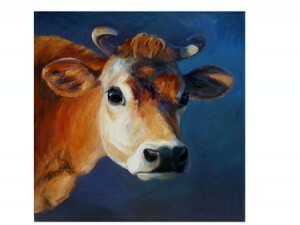 Rosemary Blackmore is a mutli-talented local artist, her beautiful paintings of Jersey Cows are instantly recognisable, but she is equally skilled at both ceramics and working with textiles. 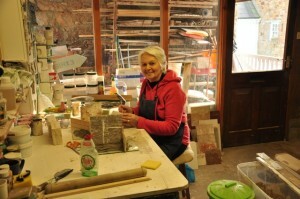 Rosemary kindly lets us have a glimpse into her studio and tells us what inspires her work. My name is Rosemary, I have been working as an artist after gaining a degree in Fine Art from Bath Academy of Art in the 1960's. 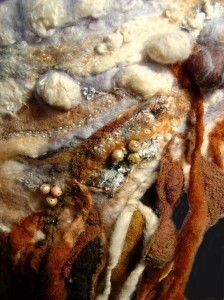 Apart from my painting, I also make hand made ceramics and textiles. Although I work in three different disciplines, I feel they complement each other, and while working in one I can find inspiration for the others. I am probably best known for my paintings of our wonderful Jersey cows, but am also inspired by the Jersey coastline, and love painting the sea in all it's moods. Atmosphere and light are particularly important to me. 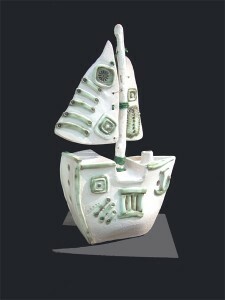 Boats also feature in my ceramics, especially quirky tug and fishing boats, as well as houses, relief tiles, and ceramic letters, which are mounted on distressed wood. I thoroughly enjoy the process of making things in three dimensions and the sometimes unexpected results which come out of the kiln! My textile work takes the form of hand felted bunting and banners, often with the design dry needle felted in wool.I am also in the process of exploring three dimensional forms, again dry needle felted, such as little birds. Some robins may make an appearance around Christmas time! My typical day starts with a walk with our Weimaraner on St. Ouen's beach, or perhaps on the cliffs at Gronez. Then it's into my studio which is just up the drive from our house. The studios are in a separate building, with a small room for my pottery, and the painting studio above. I always try to get in there in the morning, and if I'm lucky will carry on after a brief lunch as well. I feel very fortunate to be able to work from home, and my only complaint is that there aren't enough hours in the day! 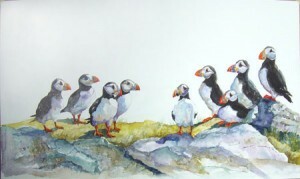 You can find Rosemary’s work at the Harbour Gallery in St. Aubin, Maison La Mare, The Spice House, and Framing Workshop in St Helier, or on her website RosemaryBlackmore.com Rosemary also has a Gallery at home in St. Ouen, called Bluestone Studio, which is open by appointment.